As a grom hiding my sexuality, I scoured the internet to learn about other gay surfers. Not just any surfer, though, but a renowned professional. I needed a role model. Growing up, all I could think was “I surely cannot be the only gay professional surfer?” It hurt having no one to aspire to be like. Hypothetically, if the likes of Kelly or Taylor Knox were “out,” gay men, then I think surfers worldwide would be more accepting and understanding of the pain and hardship that closeted people face on a daily basis. That person in the closet would have peace of mind knowing there was somebody else out there just like them. So my teen years were a mix of suicidal tendencies and loneliness due to the simple fact that I thought that I was the only gay surfer out there. I wanted to make a name for myself in surfing but thought it would be impossible. Keala is the closest thing I had to the role model I was looking for. And she’s one of the only women in the world to tackle waves most men are afraid to even look at. I’d originally wanted to interview her for Pride Month (June) and to my surprise, when I messaged her, she agreed to an interview. What I got from Keala was better than I could have ever imagined. “I will start off by saying my answers are very real, raw, and authentic,” she told me. She gave me a real and unfiltered look into her life and the struggles that she has faced. I wish I’d known some of these stories when I was young. I am sure that this read will positively enlighten others in that same dark place, afraid to speak out for fear of rejection. If I’d read this when I was 15-years old, life would have been much easier for me even to this day. I grew up in Kauai. My entire family surfed. My father had me on the front of his surfboard when I was still in diapers. All the neighborhood boys surfed. And those boys happened to be Andy and Bruce Irons, Reef Macintosh, Kamalei Alexander, Dustin Barca, Danny Fuller…so I had a lot of talent around me to draw inspiration from. I used to compete with all those boys and beat them in contests from time to time — which they weren’t very fond of — so they were extremely hard on me in and out of the water. It made me a really tough little tomboy. How did life on the Tour treat you? Life on the Tour was very hard for me. I was a closeted homo and I felt an enormous amount of pressure from the ASP (now WSL) and my sponsors to keep that a secret. So I was living a double life and dying inside every day that I wasn’t living authentically. I struggled with extreme depression. The only thing that made me feel good was winning but if I was losing that compounded my depression to the point where I would be having constant thoughts of suicide. So in 2006 when I was offered a role as a season regular on an HBO TV series, John From Cincinnati, I decided to leave the Tour. When did you “bite the bullet” and come out of the closet and what was the reaction? I didn’t make some big announcement or anything, I just started bringing my girlfriend to events and introducing her as my girlfriend instead of my “friend.” The reaction was very high school with a lot of people talking. It was stressful. My contest results started getting worse and sometimes when the heat was really close and I felt like I didn’t get the score I needed, I would wonder if that was punishment for coming out of the closet. When the show (John From Cincinnati) didn’t get picked up for a second season, I started losing sponsors. In 2008, I lost three out of my four major sponsors: Red Bull, Spy, Vestal. Billabong didn’t drop me but systematically started cutting my salary down to almost nothing; from making six figures in 2007 to just a small travel budget of $3000 in 2015. I never understood if that was because I was gay and out of the closet, because of the economic meltdown, or probably a combination of both. The year Billabong dropped me was the same year I made history by winning the Barrel of the Year award at the WSL XXL Awards, was nominated for an ESPY, and became the first woman to be invited to the Eddie. So to me, that was the most successful year of my entire surfing career and yet I had no sponsors and went into enormous debt paying to get to big swells on my own credit cards. It was very confusing for me and again, I fell into bouts of extreme depression. Do you feel a stigma is attached to your sexuality? Yes. I’ve constantly been told by surf industry sponsors that I’m not “marketable” and I think that’s directly attached to the fact that I’m a lesbian. But I think times have changed and that is a very old, outdated concept. Millennials are super into LGBT everything. I think the fact that I’m an out gay person that is breaking gender barriers and fighting for equality would make me extremely marketable. From the days when you first exploded onto the scene to today do you see much of a change within the surfing community for gay people? I don’t see any out gay athletes on the WSL Tour. You know that at least 10-15 percent or more of athletes on the WCT and QS would have to be gay based on statistics and yet I don’t know of any currently “out” athletes in surfing. I know what it feels like to be in the closet and to protect your career and it’s really, really scary. Everyone needs to come out on their own terms when they are ready. It would just be cool if they would do it while they are on the Tour and in the spotlight. That would do incredible things for the LGBT community. Looking back sometimes I regret staying in the closet as long as I did. I could have been a positive LGBT role model sooner but the bottom line is I was selfishly and unauthentically benefiting from the “straight privilege.” And I loved getting paid to surf. I miss getting paid to surf but I would not trade it for living my truth. Once you start living authentically, that feeling is so freeing it’s impossible to live any other way. Do you feel like you have made much of a difference? What would you say to that kid in every classroom around the world who is scared and embarrassed by their sexuality? My parents were disappointed when I came out to them. Not because they have anything against gay people but because they knew how society treated gay people and they hated what they knew I would be put through. They could not understand why I would “choose to make my life harder” than it already was as a female in a male-dominated sport. It took them a while to understand that this was not a choice — this is who I am. Me pretending to be straight was a choice. It was a choice that was slowly killing me. My life would have been a lot easier if I was straight but to quote the master himself, Bruce Lee, “Don’t pray for an easy life, pray for the strength to endure a difficult one.” Being a female in this sport and a lesbian stacked all the cards against me but that difficulty drove me to achieve amazing things that I probably would not have accomplished if I was straight and had a bunch of sponsors supporting me. My life has not been easy. My life has been hard but it has been that discomfort that pushed me to go bigger, dream bigger, and tap into my greatest potential. Being able to pick myself back up over and over when life has knocked me down and overcoming that to succeed has shown me how strong I truly am. So no, I do not wish to be straight. I am perfectly fine the way I am. I don’t need to change, the world needs to change and embrace its gays. Quite frankly, we are kind of amazing. Like, look how awesome the boys decorate and the girls are single-handedly responsible for keeping the flannel fashion trend alive and strong since the early 90s. Also, I’m quite sure the gays are the Earth’s solution to population control, so the rest of the world should really be throwing us a parade. At the end of the day, love is love and love is all there is. I could go on and on talking about your accomplishments but can you tell me what has been your personal favorite and the title that you are most proud of? The accomplishment I’m most proud of is winning an open gender category at the XXL Awards. A woman had never been nominated and nobody thought a woman could win an award like that, myself included until I did. That was a glass ceiling shattering moment that I will cherish forever. Also, because I’m born and raised in Hawaii and know the history, being the first woman invited to the Eddie in 2016/2017 was a huge honor for me. Keala Kennelly (Haleiwa, Hawaii, USA) rides the biggest tube ever challenged by a woman surfer at Teahupoo, Tahiti on July 22, 2015. The image is an entry in the 2016 WSL Big Wave Awards. 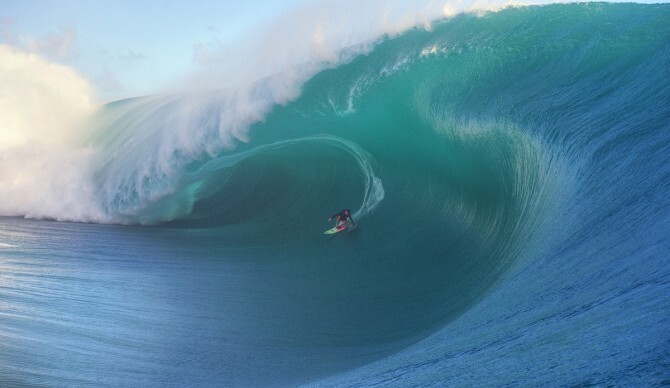 Exceptionally large surf has been experienced worldwide in 2015. That wave you caught left people with heart palpitations. How did it feel to beat the guys and show the world that women can charge just as hard as men, if not harder? I had been waiting all day at Teahupo’o for one of the boys to be generous enough to let me take a turn. The sun was starting to set and I was getting really bummed that I wouldn’t get a chance. Finally, Raimana came in from charging to take a break and let me borrow his ski and driver. The wind had started to come up, making it kind of sketchy, so I sat out the back for a while waiting for one that looked clean. I saw that one. It looked like it was gonna be a bomb and I knew this was probably my only shot so I took a deep breath and told the driver to go. I had to drop in really straight to negotiate a huge trench on the face because it sucked off the reef so hard and then had to drive really hard off the bottom and almost kick stall to not get too high in the barrel. I had a really good line but I was super deep and the West Bowl jacked and bent sideways. I was almost coming out when the foam ball completely vaporized me. Everything went white and I thought I died. It was one of the worst beatings of my life but I didn’t get any major injuries so I was stoked and when I got back out to the channel. I knew the wave was big but I didn’t realize how big it was until Brent Bielmann showed me the photo. As for winning the award, I was honestly blown away that I won. I didn’t think they would let a woman beat out all the men. I think my win was a huge boost for the women and I think that was a catalyst for the women’s big wave tour moving forward. So I’m really stoked and grateful for that. Don’t ever let other people’s opinions set your limits. If I had listened to all the things people told me I couldn’t do, I would not have accomplished even half of the things I have done in my life. Go figure out what your limits are for yourself. You might be surprised when you discover you are capable of so much more than you ever imagined. And remember, everything you want is waiting for you outside the boundary of your comfort zone.